RE: Account compromised and hacked, $500 transfered, what can i do? Thanks for all the concern and advice guys! Will be away from burst for some time until i rebuild my income and my burst portfolio soon, hope everyone will be great and good luck burst! Yeah, as previously i created 3 wallet, 2 passphrase auto generated and 1 passphrase manual generated. And among 3 i used the manual generated account where i didn't realize that the passphrase is just so weak. 4x4(character) word in continuous form. Account compromised and hacked, $500 transfered, what can i do? Is it possible to revert transaction or something? RE: [SOLD-OUT] CCMINER_100TB new asset! Do you have any idea to improve the current dividend ROI? As months ago the dividend is good until more and more people joined in, and we have other assets which pays 1-2% Weekly, do you have any long term plan for that? Anyhow just wanted to ask, what would you do to the investors if this project failed? Will you be buying back all the assets or some kind of reimbursement? hello nameless, i read the announcement thread, it stated 402 assets doesn't pay dividend, Is it currently started to be paying dividend weekly? 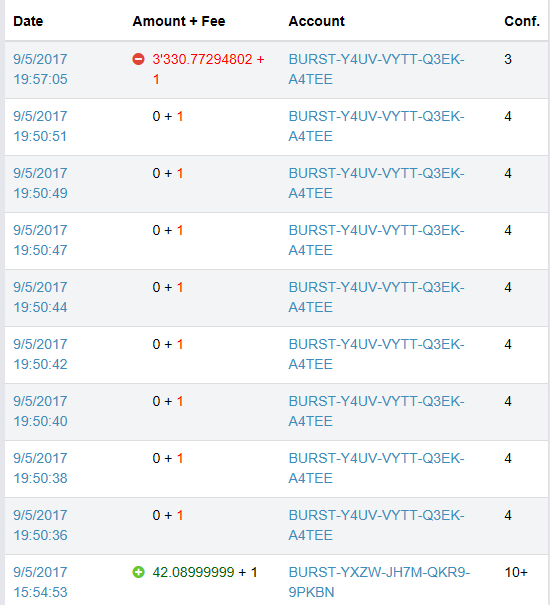 Therefore i invested into burst and bought some assets. Then something bugged me, of course if burst price rise, my assets value goes higher. But will the return of reward in amount of burst the same or it will get affected? Next, Aside from Ccminer, Bsilver, any other great daily payout assets? Hello so currently does this coin still pay dividend for holding? As currently other than CCminer which is verified and legit that make daily payout, is there any other similar assets?